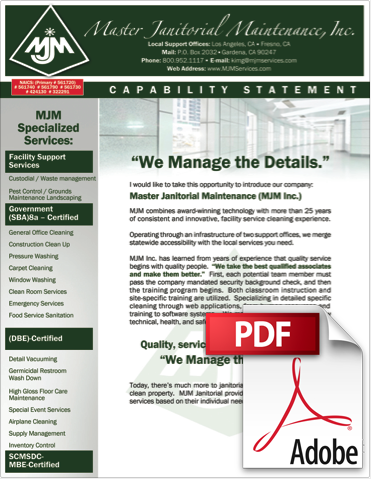 "I never realize how much a difference can be made by a janitorial service until we changed services. [Your crew] has completely transformed the appearance of our building." "The service and response to our needs has been excellent." "Your Weekend service makes Monday mornings a lot more pleasant...and [we] especially appreciate all of your efforts to work around our sometimes chaotic schedule." -Bobie F. Fomby, Office Manager Lincoln Security Services, Inc.
"I just wanted to let you know how surprised and delighted I was on Monday morning when I came to the offfice and saw CLEAN carpet. It looks Great!!" "... quality standards are among the highest we have had the pleasure of experiencing." "Thank you for the great service you are providing for us"
"...there have been other janitorial companies here in the past and quite honestly they come nowhere close to the quality of service you folks provide."